Based on reviews from 202 experts and 28,877 users. Learn how our rankings work or see our guide to New Balance running shoes. Updated Apr 2019. The New Balance Arch Support Company was founded by William J. Riley in 1906. This brand manufactured shoe accessories that were meant to support the arch and provide flexible performance. The idea of being able to add more features to the underfoot experience was relatively fresh during that period, so the business was new, and he had to explain the technologies to people. What Riley wanted was to provide people with add-ons that helped the tendons and muscles of the underfoot to relax and be engaged during the stride. He believed that balance was a cornerstone of having an efficient walk or run. Riley coined the company name, “New Balance” through his scrutiny of chickens strutting along in his yard. What he noticed was that the three-point structure of the chicken foot evoked a perfect balance. He wanted that kind of biomechanical assembly to be present in shoes. He felt that it could help many people, particularly those who had jobs that required them to stand for extended periods. Whenever people went inside his office to get more information, Riley showed them a chicken foot that he’d been keeping on his table, demonstrating its capacity to maintain equilibrium when on the surface. 1956 saw Riley selling his business to his daughter Eleanor Riley. She and her husband Paul Kidd continued the thriving trade of vending arch support units. Then in 1960, they created the first running shoe to have a ripple outsole, the Trickster. This product was also the first of its kind to be available in multiple widths. The small company didn’t reach its full potential until the late ‘70s when Boston gained traction as the nucleus of the Marathons that graced the United States. The brand experienced a resurgence, selling running shoes aplenty because of the rise in popularity of competitions and speed training sessions. Throughout the years, New Balance made gradual yet sure steps to meet the signs of the times and improve the catalog of running shoes. The brand has even expanded to other activities and sports such as Basketball, Hiking, and Training. Shoe enthusiasts and athletes have worn, and/or won in, the products that have the famous ‘N’ logo. And it doesn’t seem as though it’ll lose speed anytime soon. New Balance makes use of compounds and components that work together to deliver a smooth and well-rounded running experience. The company devices several iterations of well-known features, improving upon the design and the functionality. Fantom Fit – This feature is used on the upper unit, and it utilizes a form-fitting mesh that’s merged with a layer of synthetic material that supports its structure. The fusion of these parts is meant to deliver a comfortable, flexible and breathable coverage. The non-bulky construction of this component also benefits the look of this shoe because it evokes the façade of a casual sneaker. Moreover, it has a no-sew configuration, which means that it won’t cause any irritation to the foot of the wearer. Abzorb® – This cushioning system is used on a variety of New Balance running shoes. It’s meant to mitigate the impact force that’s generated by the foot-strike while enabling the foot to transition responsibly towards the toe-off with ease. It’s made using the mix of brand-exclusive foam, and DuPont™ Engage® isoprene rubber to make it durable and less prone to wear-and-tear. It’s placed in the heel and forefoot sections, absorbing the landing energy while preventing slippage. Such a mechanism has the goal of making the ride much smoother. Acteva™ – This technology is a full-length foam that’s designed to cushion the foot throughout the activity. It’s a lightweight unit, advertised for being 12% lighter than most options on the market. The DuPont™ Engage® that’s mixed with it is a promoter of heightened durability as the wearer uses the New Balance running shoe over time. It has two other versions, namely the Acteva Lite (24% lighter than standard foams) and Acteva Ultra Lite (32% less weight than similar variants). Fresh Foam – Cushioning is one of the hallmark traits of a New Balance running shoe. Runners expect an underfoot experience that respects and enables the performance of their feet. New Balance devised the Fresh Foam technology to encourage an energized step. It’s made using a specialized formula for the creation of the ethylene vinyl acetate (EVA) compound. The polished chemical properties aim to make the output more invigorated than when wearing standard versions of this foam. The liquid form of the EVA is injected into a mold, allowing it to take the shape of the walls of that frame as it cools and settles. The mold/template has various convex and concave patterns that serve a more mechanical purpose: to allow the final foam compound to have different areas of compression and resistance to the landing forces. Such a design may ease the foot-strike. N2 Cushioning – Some runners just want a shoe-platform that’s well-cushioned yet unconstrained by a large construction or a weighty profile. It’s made using less foam/material than the regular full-length platform. It’s straightforward in its visual aspect, as well. All these elements help in reducing the bulk, whether it means weight or aesthetics. T-Beam – This component is placed in the midfoot section of the New Balance running shoe. It is made of thermoplastic polyurethane, and it doesn’t have a substantial weight. It is also flexible. Its purpose is to support the tendons and muscles of the foot-pad, preventing them from tensing up or wearing out during the activity. New Balance whips performance shoes year after year, and they show no signs of slowing down at any rate. Throughout the years, the company has introduced products that aim to tickle consumers’ tastes for variety and functionality. Now, they have several series and updates to existing rosters, ensuring that their consumer-base is kept sated of their craving for efficient performance footwear. 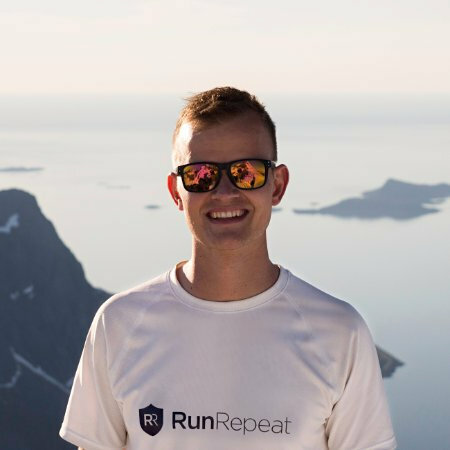 Regarding RunRepeat’s CoreScore, it’s a percentage-based scoring system that determines how a running shoe is favored. It uses the score-based feedback from reviews and consumers, then averages them to get a cohesive grade. This New Balance running shoe is designed for those who have neutral pronation. It features an engineered mesh upper to ensure breathable and form-fitting coverage. It also makes use of the much-lauded Fresh Foam midsole to deliver a luxurious underfoot experience that’s ready to absorb impact shock. An updated flex groove configuration on the outsole allows the wearer to bend the foot with ease as they go through the gait cycle. The 4th version of the 990 series is a passion shoe of the company. It has the “Made in the USA” label, which means that it’s designed and assembled by US workers in factories in New England. It’s a product that preserves the look and style of performance footwear in the ‘90s. It makes use of a pigskin-and-mesh façade to celebrate the leather craze that highlighted the end of the 20th century. An Encap® carrier with an EVA core serves as the underfoot cushioning system. A breathable and non-irritating in-shoe environment is one of the Vazee Rush v2 goals. It has a net-like upper structure for exceptional ventilation that captures the attention of passersby. A no-sew process staves off hot spots and potential causes for blistering. The responsive and energy-giving Rapid Rebound midsole delivers a vigorous step. 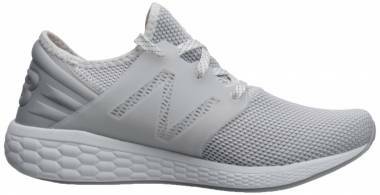 This New Balance running shoe is specially designed for those who want their gait to have more balance and those who wish for their idle stance to not be painful. Some people may need some anatomical support systems to handle running, so it’s this product’s job to keep the foot moving correctly. A stitched-overlay-laden upper holds the foot in place and prevents it from wobbling, while a Rollbar-reinforced platform saves the tendons and muscles of the foot-pad from giving in when taking each step. The 5th version of the 610 is a daily running shoe that’s made for those who have neutral pronation and people who just want to tackle the trails. It is a straightforward performance shoe that has a sporty design and a set of trail-ready components. Open mesh and synthetic overlays bring a secure yet aired coverage while impact-attenuating cushioning systems handle the force of landing the foot on the ground. Semi-prominent gripping lugs on a ground-contact outsole configuration allow surface control. New Balance, as a company that values arch support and the mechanics of efficient performance, wants consumers to experience a smooth and enabled performance. The stride and the elegance of the pace have been the core value that has kept the company standing for years. Foot pronation is an essential aspect for them, and they want their products to be more than competent at addressing the needs of consumers. The New Balance running shoes are categorized into types: Neutral, Stability, and Motion Control. All three groups cater to specific of the runner, making sure that options are there to address any concern that the foot may have when standing idly or when moving. If you don’t know if you overpronate or not, you should diagnose your gait pattern by checking yourself (shoe wear pattern, the wet test) or by getting evaluated by a podiatrist or a shoe expert at a footwear store. To know more, check out RunRepeat’s list of the best stability running shoes. Dual Density Post – This material is placed on the medial side of the New Balance running shoe’s midsole. It’s a foam unit that is thicker than the cushioning platform. It’s meant to support the arch of the foot and maintain the structural integrity of the cushioning system. Rollbar – This composite thermoplastic polyurethane (TPU) material is meant to provide total foot steadiness. It is present in the medial and lateral sections of the platform, staving off both overpronation (inward rolling of the foot) and underpronation (outward rolling). Motion control shoes for severe pronation concerns are the products that use this component. Soft Lateral Rubber Outsole – This unique design involves the rubber layer of the outsole being more delicate on the lateral side than the medial Such a configuration allows the foot to lean outward when wearing the shoe, thus helping against overpronation. The Fresh Foam Vongo series uses this stability mechanism. T-Beam – This New Balance-developed component benefits both neutral pronators and those who have concerns with their gait. After all, its purpose is to act as a foundation for the muscles and tendons of the foot-pad, saving them from strain and fatigue. Trail running has become a trend over the years, and many people favor it because it exercises both the body and the senses. Being able to gain control of the surrounding topography requires mental focus and deft instinct, and people enjoy being in the great outdoors. New Balance designed their roster of trail shoes to accommodate the needs of the foot firstly. There are well-cushioned options wherein the platform has sufficient underfoot support; minimalist variants for those who want a lightweight product that doesn’t impede ground contact; and those who have overpronation need not worry for there’s likely a stability-focused option. Vibram® outsole – This compound is well-known for providing exceptional grip on the unpredictable terrains. Its namesake, the company Vibram®, prides itself as a reliable provider of outsoles that can last a long time. Some New Balance running shoes that use this feature: the Fresh Foam Hierro v3 and the Minimus 10 v1. AT Tread – This rubber compound has a versatile design. It allows the wearer to run on both uneven and flat surfaces. It has gripping lugs that are for ascents and descents, but they’re not as prominent as the ones that are patterned on other trail shoes. The FuelCore Nitrel Trail is a New Balance running shoe that has this configuration. ROCK STOP® - This material is a highly durable ethylene vinyl acetate foam or thermoplastic polyurethane unit that is placed between the outsole and midsole. Its goal is to shield the foot from irregular surfaces and potentially harmful trail debris. Moreover, it’s lightweight and flexible. One of the New Balance running shoes that have this technology is the Summit Unknown. Toe Protect™ - It is a rubber compound that lines the exterior curve of the forefoot. It acts as a barrier between the foot and the various hazards that are on the trails. People loved the 5th version of the 610 because it gave a supportive underfoot experience. The design and aesthetics also gained positive points. What really got into the hearts and minds of consumers was the availability of a wide-width option. For them, it’s a rarity to have a trail running shoe that isn’t limited to a single width profile. This New Balance running shoe has the unique position of being one of the rare trail companions that have features to combat overpronation. It has an upper unit that’s reinforced with printed and stitched overlays, an aggressive outsole from Vibram®, and a stable underfoot platform that incorporates a pronation-correcting medial post. The Summit Unknown was a hit among testers and reviews alike. They liked the breathable and easily-to-drain upper construction, the trail-ready outsole unit, and the surprising lightness of the silhouette. Its overall design isn’t aggressive, as well; it doesn’t have the unnecessary layers or movement-limiting add-ons. The 690 v2 Trail is available in various color schemes, and people loved that. Seldom are trail shoes rife with a splash of vibrant hues; that’s one of the reasons why it’s well-liked. Its reasonable price tag was also given praise. 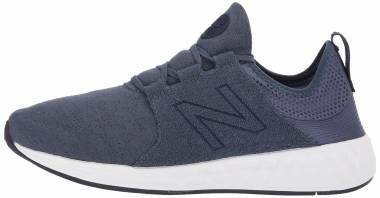 Moreover, the softness of the upper and the responsiveness of the midsole became highlights of this New Balance running shoe. 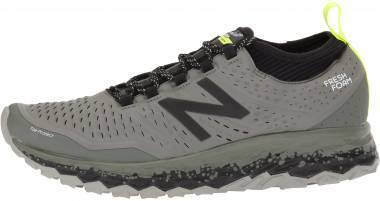 This New Balance running shoe has a traditionally sporty design that’s common in many trail running companions. 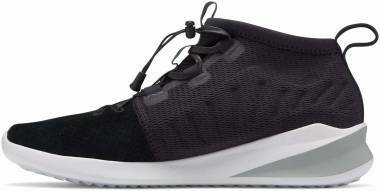 It has the regular breathable mesh that serves as the upper unit, and it’s reinforced by leather overlays that almost encompasses the entire upper. It’s a structure that heightens the durability of the product. The AT Tread outsole allows this shoe to transition effortlessly between the roads and the trails. The responsive performance of the Vazee Summit v2 led many consumers to welcome it as their choice of footwear for their technical trail running sessions. The breathable upper of this New Balance running shoe and the lightweight materials were also lauded. Moreover, it didn’t evoke an aggressive design because it has a simple-looking façade that’s meant to encourage freedom of movement. Environmental waste is one of the principal problems of the world. Products are made from components, and some parts do not see the shelves. There are also products that tend to quickly get thrown out because of a variety of factors such as flimsy construction and decreased customer satisfaction. The world is slowly being engulfed by the waste generated by the advancement of the industry. Such are the reasons why the New Balance brand is moving the environment forward. The persons in the creative labs are aiming to use methods and techniques that are more helpful to nature. The standards and principles that drive the business and manpower are also based on cleanliness and orderliness. These fundamental values that drive the company are also being used in the process of creating and distributing the products. New Balance also stresses the restriction of certain substances from their products. It’s widely known that certain chemicals and solvents are used in the making of running shoes. The New Balance Product Chemistry Team receives reports about the substances that are possibly going to be used in the factories, strictly employing the quality standards that revolve around environmental sustainability. The company even has a Restricted Substances Manual to reinforce such regulations. What is New Balance NBRx and how can it help me? New Balance has been in the business of providing support and comfort to the foot for decades, and they’re extending that capacity to the shoes that they’re creating. The NBRx approach allows the brand to be more amenable when it comes to providing technical support-shoes, prescription footwear, and orthotic inserts. A fundamental aspect of the foot determines the need for an NBRx product: the arch. The type of arch may just decide the kind of footwear or insert that you need for your daily activities. A flat foot (overpronation) deserves a stability or motion control shoe while either the normal arch or high arch (underpronation) types need well-cushioned underfoot experiences. You may go to a footwear expert or a podiatrist to know what kind of shoe you need. Brick-and-mortar shoe stores offer expert evaluation. What differentiates a water-resistant shoe from a waterproof one? Water-resistant shoes allow the foot to stay dry when in slightly wet conditions. Early morning dews and light drizzling are examples of situations in which water-resistant footwear are helpful. The Fresh Foam Kaymin TRL is an example of a water-resistant New Balance running shoe. Getting exposed to rains and puddles can be bothersome when running, so it’s the job of waterproof shoes to adequately protect the foot-chamber from water infiltration. Such a feature potentially improves the confidence of the runner when traversing such conditions. The New Balance 880 v7 GTX and the 910 v4 GTX are waterproof New Balance running shoes. Some New Balance running shoes have the letter “v” and a number after the name. What do these distinctions mean? The “v” stands for “version,” and it means that a particular running shoe-model has undergone one or more updates, thus turning it into a series. The number that comes after the “v” indicates the version number or the shoe’s place in the generational upgrade. Renewing a product via a new version entails the use of innovative technology or widely known features. Some updates are merely restricted to one part of the shoe while others involve a complete overhaul. For example, the New Balance 880 v8 is an update to the 880 series of running shoes. Its immediate predecessor is the 880 v7. Why should I buy a running shoe? Running shoes have specific designs that encourage and energize forward motion. Unlike casual footwear, these options have a thicker heel platform for impact protection during the foot-strike and a thinner forefoot profile for propulsion during the toe-off. The heel-to-toe differential encourages the foot to move forward. Most shoes that are created explicitly for running are graced with lightweight and breathable mesh. This material allows environmental air to seamlessly enter the foot-chamber, thus ensuring a cool and dry in-shoe experience. Which is best for me, a cushioned shoe, a stability shoe or a motion-control option? Neutral cushioned shoes are designed for those who do not have problems with pronation. Their feet don’t roll inward when taking each step. Neutral footwear also benefits those who supinate (outward turning of the foot) because all they need is a well-cushioned platform that leads them toward a smooth and comfortable heel-to-toe transition. You would know if you’re a neutral pronator if your foot doesn’t have a depressed arch structure. Furthermore, you can check if you’re a neutral runner if the soles of your shoes exhibit an even wear pattern. Stability shoes are constructed to correct mild or moderate overpronation. These products make use of features and technologies that are specifically for pronation control. Some examples of these features are the Rollbar and the medial post. If you’re someone who suffers from moderate or severe overpronation, then you might need motion-control shoes. These products are designed to fully support the entirety of the underfoot, combining foundational structures for both the lateral and medial sections of the platform. When should I replace my New Balance running shoes? The weight of the body – This factor is essential in knowing how long the underfoot platform of your running shoe is going to last. A heavy bodyweight may put more strain on the midsole foam, thus making it prone to sagging or material breakdown. The regularity and intensity of exercise – If you’re one who is leading an active lifestyle, then you must be in your running shoes for at least once a day. Workouts and exercises are impact-bearing activities that may subject your shoes to wear-and-tear. So, it is essential to check your footwear for any signs of overuse and damage. You may end up with your preferred sports shoes for more than a year, but it’s also safe to know when to change into new pairs. Use and storage – Some New Balance running shoes require being used in harsh environments (technical trails). If they’re exposed to such conditions, then they’re being used for their purpose. But it’s also expected for these pairs to be in for a beating. Impacts, scratches and other outdoor hazards may affect the lifespan of your shoes. Moreover, the idle times need to be considered; if the shoes are wet or caked in dirt, then you would need to clean them. Storing damp or dirty shoes may diminish the strength of the components. Bacteria may also proliferate in unkempt footwear, and such nuisances usually result in an unhealthy in-shoe environment and various foot problems. So, take care of your shoes.